Russia could become a primary site for testing the high-speed Hyperloop One technology, which was inspired by American entrepreneur Elon Musk. Investment has already been made in the project, and officials have announced plans to develop the idea of launching vacuum trains in the Far East and in Moscow. The Russian Direct Investment Fund (RDIF), established on the government's initiative for investing in large infrastructure projects in the country, made an unusual investment in June 2016. The foundation, along with international venture companies Sherpa Ventures, Formation8 and ZhenFun, invested in the Hyperloop One project. The new technology, inspired by Elon Musk, founder of SpaceX and Tesla, promises to transport passengers and cargo at a speed of up to 745 mph in special capsules through tubes with low pressure. During initial testing in Nevada in May 2016 the capsule was able to move only at a speed of 120 km/h. Nevertheless, Russian President Vladimir Putin supported the project and Transportation Minister Mikhail Sokolov promised to introduce the technology to transport cargo in the Far East. In his words, containers could be shipped from China to Europe through Russia in just one day using the technology. The size of the investment is unknown, but it probably did not exceed $100 million, said Georgy Vaschenko, director of operations on the Russian capital market at Freedom Finance. According to Vaschenko, for Russia it is important to first study the experience of introducing new technologies abroad in order to understand the opportunities for using them in Russia – in his view, the Hyperloop “still looks like an exotic form of transportation." "I don't know of any examples of RDIF investing in foreign companies," said Anton Krasko, an expert analyst at MFX Broker. RDIF itself says that it is interested in the project because of the uniqueness of the technology involved, with the fund’s general director Kirill Dmitriev keen on the idea that Hyperloop One technology can first be used for transporting containers and then people. "Our investment in Hyperloop One will provide access to leading technologies for the Russian market. Together with its international partners RDIF will support the project not only on Russian territory but also in the Middle East and Far East markets," explained Dmitriev. "We are now speaking to Russian Railways about the first pilot projects and hope that in the nearest future we will be testing this technology in Russia," he said. It is not by chance, he added, that General Electric and France’s state rail operator SCNF have also invested in the project. In May 2016 Russian Railways created a working group to collaborate with Hyperloop, reported the Vedomosti newspaper. However, according to the publication, the initiative to establish the group was taken by the American company, which offered Russian Railways its technology, and by the end of this year Russian Railways must evaluate the vacuum trains' safety. "It is very probable that RDIF invested in the project after Russian Railways mentioned the possible construction of the Hyperloop train on its facilities," said Konstantin Bushuyev of Otkrytie Broker. In June 2016, as part of the St. Petersburg International Economic Forum, the technology's developers met with Vladimir Putin, who gave his support to the project, said his press secretary Dmitry Peskov after the meeting. Following the forum, Moscow's authorities agreed with the company to develop the idea of using Hyperloop in the Russian capital. Ziyavutdin Magomedov's Summa transportation group will participate in the realization of the project. Magomedov is considered a close friend of Russia's Deputy Prime Minister Arkady Dvorkovich, who himself has often spoken in favor of introducing contemporary technologies in the transportation sector. For example, Dvorkovich has promised that in 2018 during the World Cup, driverless buses will carry passengers on the streets of Moscow. Magomedov's venture capital company Caspian VC Partners has also invested in Hyperloop One. 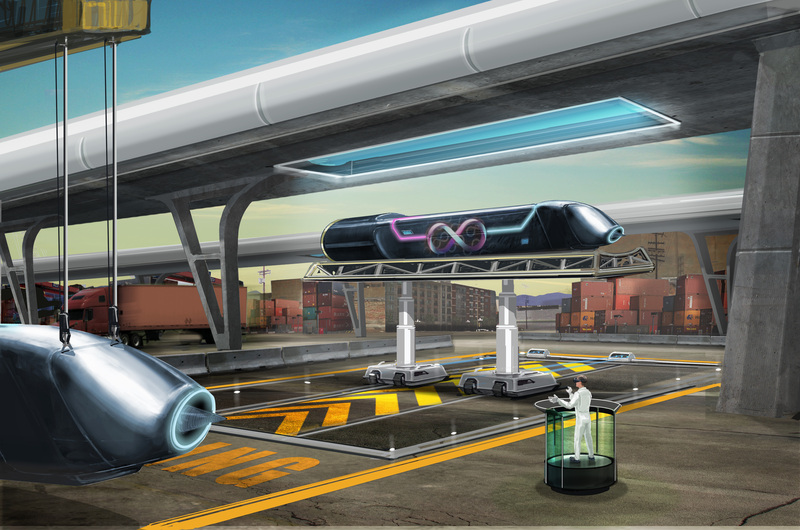 Representatives of the Moscow mayor's office are so far being cautious in their evaluation of Hyperloop One, especially concerning the transportation of passengers. "It is still too early to say anything concrete about the technology, although it would be important for transporting cargo," Deputy Moscow Mayor Marat Khusnullin told the TASS news agency. In turn, Russian Transportation Minister Mikhail Sokolov said that Hyperloop One would be essential for transporting cargo from China's northern regions to the Russian port of Slavyanka in the Far East. The minister estimates the project to cost 30-40 billion rubles ($475-634 million) and Chinese investors will join the project, including the Silk Road Foundation. According to Pushkarev, it was this dimension that Hyperloop One's chairman Shervin Pishevar was talking about at the St. Petersburg International Economic Forum.